The overall duration expected for the project is 36 months and the activities that are going to be developed throughout the project are structured in 9 Work Packages, each divided into different tasks. Six of them correspond to research activities (WP1 to WP5 and WP7), while WP6 will be dedicated to demonstration activities, WP8 is related to others activities (dissemination, exploitation and training) and WP9 to administrative and Financial Management. 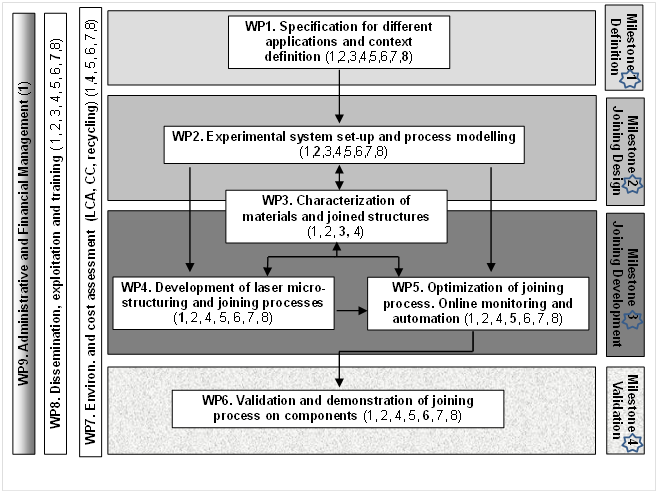 The overall structure of the PMjoin project and interdependencies of workpackages are visually represented in the following Pert diagram.